Background and objectives Metabolic acidosis is common in patients with CKD and has significant adverse effects on kidney, muscle, and bone. We tested the efficacy and safety of TRC101, a novel, sodium-free, nonabsorbed hydrochloric acid binder, to increase serum bicarbonate in patients with CKD and metabolic acidosis. Design, setting, participants, & measurements One hundred thirty-five patients were enrolled in this randomized, double-blind, placebo-controlled, multicenter, in-unit study (designated the TRCA-101 Study). Patients had a mean baseline eGFR of 35 ml/min per 1.73 m2, a mean baseline serum bicarbonate of 17.7 mEq/L, and comorbidities, including hypertension (93%), diabetes (70%), and heart failure (21%). Patients ate a controlled diet and were treated for 14 days with placebo or one of four TRC101 dosing regimens (1.5, 3, or 4.5 g twice daily or 6 g once daily). After treatment, patients were discharged and followed for 7–14 days. Results All TRC101 treatment groups had a mean within-group increase in serum bicarbonate of ≥1.3 mEq/L (P<0.001) within 72 hours of the first dose and a mean increase in serum bicarbonate of 3.2–3.9 mEq/L (P<0.001) at the end of treatment compared with placebo, in which serum bicarbonate did not change. In the combined TRC101 treatment group, serum bicarbonate was normalized (22–29 mEq/L) at the end of treatment in 35% of patients and increased by ≥4 mEq/L in 39% of patients. After discontinuation of TRC101, serum bicarbonate decreased nearly to baseline levels within 2 weeks. All adverse events were mild or moderate, with gastrointestinal events most common. All patients completed the study. Conclusions TRC101 safely and significantly increased the level of serum bicarbonate in patients with metabolic acidosis and CKD. Metabolic acidosis associated with CKD is characterized by an imbalance in acid production relative to excretion, resulting in the depletion of the extracellular buffer, bicarbonate, as well as buffers mobilized from bone and muscle (1–6). Chronic metabolic acidosis is common in advanced stages of CKD, and it is associated with adverse consequences, including increased mortality, acceleration of kidney disease progression, increased muscle breakdown and insulin resistance, and the development or exacerbation of bone disease (5,7–16). Clinical evidence shows that treatment of low serum bicarbonate can improve kidney, muscle, bone, and nutritional sequelae of chronic metabolic acidosis (17–24). Several prospective, controlled clinical studies, ranging from 1 to 5 years in duration, have shown that supplementation with base attenuates the progression of CKD. In these studies, oral alkali supplements (e.g., sodium bicarbonate or sodium citrate) or reduction of acid production through consumption of a very low–protein (0.3 g/kg per day) diet supplemented with ketoanalogs led to a decreased rate of eGFR decline and fewer patients requiring RRT (17–19). Current Kidney Disease Outcomes Quality Initiative guidelines recommend that base be given when serum bicarbonate levels are <22 mEq/L and to maintain a level ≥22 mEq/L, and Kidney Disease Improving Global Outcomes guidelines also recommend administering base when serum bicarbonate is <22 mEq/L to maintain the value within the normal range of 22–29 mEq/L (25–29). Use of guideline-recommended alkali therapies and/or increased intake of fruit and vegetables reflects current clinical practice; however, these interventions have the potential to introduce large amounts of sodium or potassium to patients with CKD who often have hypertension, fluid overload, and hyperkalemia (28–37). Given the clinical benefits of increasing serum bicarbonate in patients with CKD who are acidemic and the concerns associated with providing additional sodium and/or potassium, there is a clinical need for new treatment options to correct metabolic acidosis. TRC101 is being developed as an orally administered, nonabsorbed, sodium- and counterion-free hydrochloric acid binder for the treatment of metabolic acidosis associated with CKD. Acid binding is a novel approach to treating metabolic acidosis without introducing deleterious counterions, like sodium or potassium. TRC101 selectively binds and removes proton (H+) and chloride (Cl−) from the gastrointestinal (GI) tract, thereby increasing serum bicarbonate. TRC101 is not an exchange resin, and therefore, no sodium, potassium, or calcium is added to the GI tract. This randomized, controlled trial tested the hypothesis that TRC101 would safely and effectively increase serum bicarbonate in patients with CKD who are acidemic. The TRCA-101 Study was a randomized, double-blind, placebo-controlled, parallel-design, six-arm, fixed dose study that enrolled adult patients with stage 3 or 4 CKD and metabolic acidosis (Figure 1). It was conducted in two parts. In part 1 (n=101), patients were randomized in a 1:1:1:1 ratio to one of four treatment groups: TRC101 (1.5, 3, or 4.5 g twice daily) or placebo (1.5 g twice daily). In part 2 (n=34), patients were randomized in a 5:1 ratio to TRC101 (6 g once daily) or placebo (3 g once daily). One day before the first dose and throughout the 14-day treatment, all patients resided in a clinical research unit and ate a study diet controlled for protein, calories, anions, cations, and fiber in accordance with dietary recommendations for patients with CKD to provide a consistent, relatively neutral potential kidney acid load (Supplemental Table 1) (25,38). The mean potential kidney acid load for the diets was 0.8 mEq/d, and the mean daily dietary protein intake was 0.7 g/kg per day (Table 1). After completion of the treatment, patients were discharged from the clinical research unit and followed for safety for an additional 1–2 weeks. The TRCA-101 Study was registered at ClinicalTrials.gov (NCT02809183). The clinical trial was conducted within the provisions of the Declaration of Helsinki, and the protocol was approved by local hospital ethics committees and national health safety boards. The TRCA-101 Study was conducted in Eastern Europe at clinical research units located in Bulgaria (one site) and Georgia (four sites). Eighty-five (63%) patients were enrolled in Bulgaria, and 50 (37%) patients were enrolled in Georgia. Study design schematic. Overall study design for the TRCA-101 Study, including screening, treatment, and follow-up. The first 60 patients had follow-up from day 15 to day 21, whereas patients 60–101 had follow-up from day 15 to day 28. CRU, clinical research unit; n, number of patients in each treatment group; R, randomization. A total of 154 patients were screened, and 135 patients with stage 3 or 4 CKD and metabolic acidosis were enrolled in the study (Figure 2). Enrollment in the TRCA-101 Study under the original phase 1 protocol began in March of 2016. The original planned sample size was increased by a protocol amendment from 60 to 100 and again, by another amendment, which added part 2 of the study and another 35 patients. The first increase in the sample size provided more exposure to TRC101 for safety, and part 2 was added to evaluate a once daily dosing regimen. Enrollment under the amended protocol that increased the sample size to 100 began in June of 2016, concurrent with the ClinicalTrials.gov registration for a phase 1/2 study. The last patient was enrolled in the study in October of 2016, and the study was completed in November of 2016. Each patient provided informed consent. Disposition of study participants. Consort diagram of patient flow through the TRCA-101 Study detailing profile and disposition of study participants during screening, randomization, and participation in the trial. Of 154 patients screened, 135 were enrolled and randomized, with screen failure due to bicarbonate or eGFR eligibility accounting for most enrollment exclusions. All 135 randomized study participants completed treatment and follow-up, and their data were analyzed for efficacy and safety of TRC101. N, number of patients screened or number of patients in each treatment group. Entry criteria required an eGFR of 20 to <60 ml/min per 1.73 m2, a serum bicarbonate value of 12–20 mEq/L (inclusive), and stable kidney function defined by eGFR values at screening and day −1 that were within the required range and were not different from each other by >25%. For serum bicarbonate and eGFR, two qualifying values at least 2 days apart and within 7 days of randomization were required. Eligible patients were also required to have a hemoglobin A1c value of ≤9.0%, fasting serum glucose ≤250 mg/dl, and systolic BP <170 mm Hg. Patients were excluded for a low serum bicarbonate at screening or day −1 that, in the opinion of the investigator, required emergency intervention. Additional exclusion criteria included dialysis or AKI in the past 3 months, serum potassium values of <3.8 or >5.9 mEq/L at screening, or severe comorbid conditions (summarized in Supplemental Material). Patients with New York Heart Association class 1 or 2 heart failure, hypertension, and/or edema were not excluded. TRC101 was administered at doses of 1.5, 3, or 4.5 g twice daily with breakfast and dinner (i.e., total daily doses of 3, 6, or 9 g/d) or as a once daily dose of 6 g with breakfast, depending on treatment assignment (Figure 1). Placebo was microcrystalline cellulose (National Formulary Grade) administered at doses of 1.5 g twice daily or 3 g once daily. TRC101 or placebo was administered orally as a suspension in water for 14 days. All oral concomitant medications were taken at least 4 hours before or after study drug administration. 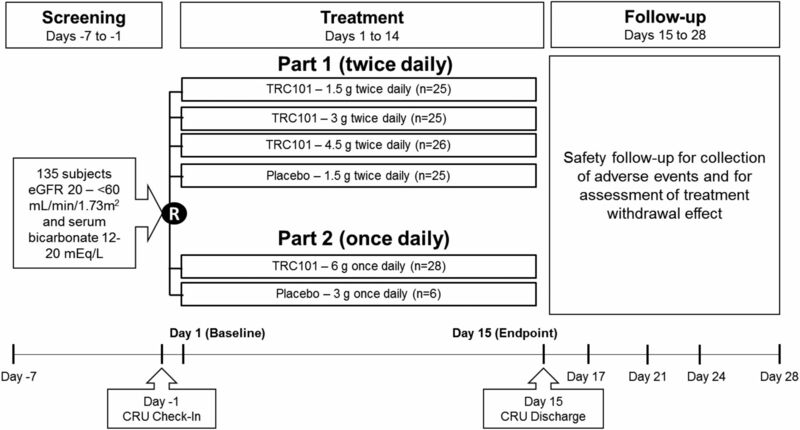 Prespecified efficacy end point analyses for part 1 were the change from baseline in serum bicarbonate to end of treatment (day 15) (1) within individual TRC101 dose groups (primary end point), (2) comparing individual TRC101 dose groups with placebo, (3) within the combined TRC101 treatment group, and (4) comparing the combined TRC101 treatment group with placebo. Prespecified secondary end points included the proportions of patients in each treatment group whose serum bicarbonate increased by ≥2, ≥3, and ≥4 mEq/L post-treatment (day 15). Prespecified exploratory end points included additional threshold analyses for serum bicarbonate (increase by ≥5, ≥6, and ≥7 mEq/L and absolute serum bicarbonate >20, >22, >27, and >29 mEq/L). Prespecified efficacy end points for part 2 were the change from baseline in serum bicarbonate to end of treatment (day 15) comparing 6 g once daily TRC101 with the pooled placebo group from parts 1 and 2 and the proportions of patients in the TRC101 6 g once daily group whose serum bicarbonate increased by ≥2, ≥3, and ≥4 mEq/L post-treatment (day 15). Additionally, the between-group change from baseline difference in serum bicarbonate for the TRC101 3-g twice daily and 6-g once daily doses was determined. Because the appearance (TRC101 versus placebo) and the amount of study drug administered differed among treatment groups, the designated clinical research unit pharmacist(s) responsible for dispensing study drug and the clinical research unit staff responsible for supervising administration of study drug were unblinded with respect to patient treatment assignment. These individuals had no other responsibilities for the study. The investigator, patients, remaining clinical research unit staff, and most contract research organization staff (including medical monitor and all personnel responsible for monitoring study records other than those reviewing drug accountability records) remained blinded to the patient’s treatment assignment throughout the study. The sponsor and the study biostatistician were blinded from the beginning of the study until the first 60 patients completed the study; the blind was removed at this point for the study sponsor and study biostatistician to assist with clinical program planning and ensure that there were no safety issues that might have affected expansion of the study to a phase 1/2 study. A prespecified blinding plan detailed the blinding procedures. Because there was no previous clinical experience with TRC101, the study sample size was determined pragmatically on the basis of enrollment estimates, the expected safety profile of a nonabsorbed polymer drug, and an estimate of effect size and variability. The sample size of 25 patients per TRC101 dose group had 82% power to detect a mean 1.5-mEq/L change from baseline in serum bicarbonate, assuming that the SD of the change was 2.5 mEq/L, for a one-group paired t test with a 0.05 two-sided significance level. A prospective statistical analysis plan was developed to analyze the safety and efficacy data for the study. Statistical significance was declared with P<0.05, two-sided test. There were no adjustments for multiplicity and multiple comparisons. The mean change from baseline in serum bicarbonate was analyzed using a longitudinal mixed effects repeated measures model. Baseline serum bicarbonate was defined as the mean of the local laboratory values from day −1 and day 1 (predose). The model included the change from baseline in serum bicarbonate as the dependent variable; treatment, time point (days 2–15), and treatment by time point interaction as fixed effects; patient as random effect; and baseline eGFR and baseline serum bicarbonate as continuous covariates. Baseline eGFR and baseline serum bicarbonate were considered two important covariates to be included in the mixed model for primary and secondary efficacy analyses. Adjustment for baseline bicarbonate and baseline eGFR was prespecified in the analysis plan. To avoid collinearity between baseline bicarbonate and baseline eGFR, before model fitting, the linear relationship between the two variables was examined, and a linear association was not found. Therefore, both baseline bicarbonate and baseline eGFR were included in the mixed model. Within-patient correlations were modeled using a first-order autoregressive covariance structure. A contrast statement was constructed to compare the combined TRC101 treatment and placebo. Additional information on statistical methodology is provided in Supplemental Material. The TRCA-101 Study was conducted from March to November of 2016. The study design and patient disposition are shown in Figures 1 and 2, respectively. There were no significant differences between the TRC101 and placebo treatment groups with respect to demographics or baseline eGFR, serum bicarbonate, or comorbidities (Table 1). The study population (n=135) had a mean (±SD) baseline eGFR of 35 (±13) ml/min per 1.73 m2 and a median (interquartile range) value of 32 ml/min per 1.73 m2 (21), whereas mean (±SD) and median (interquartile range) baseline serum bicarbonate values were 17.7 (±1.2) and 17.8 (1.5) mEq/L, respectively. Study participants had baseline characteristics and comorbidities common to patients with CKD, including hypertension (93%), diabetes (70%), left ventricular hypertrophy (29%), congestive heart failure (21%), peripheral edema (14%), and stable diuretic use (42%). The underlying cause of kidney disease in the patients was primarily due to the combination of diabetes and hypertension (54%) or hypertension alone (19%); additional etiologies included diabetes alone (10%), GN (10%), cystic kidney disease (7%), and interstitial nephritis (1%). 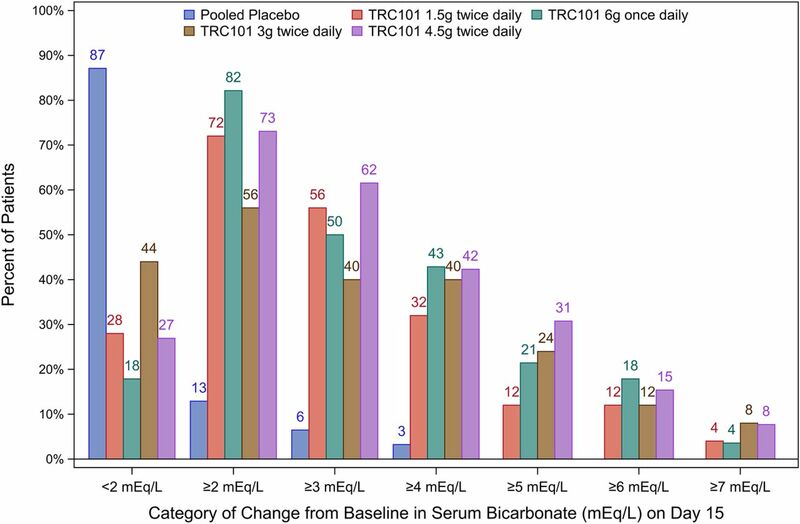 There was a significant increase from baseline in mean serum bicarbonate in all TRC101-treated groups within the first 24–48 hours (Figure 3). Within 72 hours, the least square (LS) mean increases in serum bicarbonate were 1.4 mEq/L (95% confidence interval [95% CI] of LS mean, 0.6 to 2.2; P<0.001), 1.6 mEq/L (95% CI of LS mean, 0.8 to 2.4; P<0.001), 2.1 mEq/L (95% CI of LS mean, 1.3 to 2.9; P<0.001), and 1.3 mEq/L (95% CI of LS mean, 0.6 to 2.1; P<0.001) for TRC101 dose groups receiving 1.5, 3, or 4.5 g twice daily or 6 g once daily, respectively. The within-group change from baseline for the combined TRC101 dose group was 1.6 mEq/L (95% CI of LS mean, 1.2 to 2.0; P<0.001). All increases in serum bicarbonate were significantly greater in the TRC101 dose groups than in the placebo group, which remained unchanged during this period (0.2 mEq/L; 95% CI of LS mean, −0.5 to 0.9; P=0.64) (24-, 48-, and 72-hour serum bicarbonate values are summarized in Supplemental Tables 2–4, respectively). TRC101 significantly increased mean serum bicarbonate (SBC) throughout the 2-week treatment period, with serum bicarbonate returning to baseline after treatment discontinuation. Mean SBC response with treatment over the 14-day intervention period (days 1–14) and during the 7- to 14-day off-treatment follow-up period (days 15–28) by dose group. Treatment with TRC101 caused a steady increase in mean SBC in all TRC101 dose groups during the on-treatment period. During the off-treatment period, a decrease in SBC from the end of treatment value was observed in all TRC101 dose groups, with SBC levels returning nearly to the baseline (BL) values. N, number of patients in each treatment group; SE, SEM. Over the 2-week treatment period, TRC101 increased serum bicarbonate, whereas placebo-treated patients had no change (Figure 3). At day 15, the between-group differences in serum bicarbonate versus placebo were 3.4 mEq/L (95% CI of LS mean, 2.3 to 4.5; P<0.001), 3.2 mEq/L (95% CI of LS mean, 2.2 to 4.3; P<0.001), 3.9 mEq/L (95% CI of LS mean, 2.9 to 5.0; P<0.001), and 3.7 mEq/L (95% CI of LS mean, 2.6 to 4.7; P<0.001) for TRC101 dose groups 1.5, 3, or 4.5 g twice daily or 6 g once daily, respectively (Table 2). In contrast, the placebo within-group change from baseline to day 15 was −0.2 mEq/L (95% CI of LS mean, −0.9 to 0.5; P=0.55). The mean increase in the combined TRC101 dose group was 3.6 mEq/L higher than in the placebo group at the end of the treatment period (95% CI of LS mean, 2.8 to 4.4; P<0.001). At day 15, there was no significant difference in the mean serum bicarbonate increase when TRC101 was given at a dose of 3 g twice daily versus 6 g once daily (−0.5 mEq/L; 95% CI of LS mean, −1.6 to 0.7; P=0.42) (Table 2). Treatment with TRC101 caused a steady increase in mean serum bicarbonate in all TRC101 dose groups during the treatment period (Figure 3). The slope of the increase did not appear to plateau during the 2-week treatment period, suggesting that the maximal increase in serum bicarbonate using the studied doses of TRC101 was not established in this study. The change in serum bicarbonate was similar in all groups treated with TRC101 at the end of the treatment period. After 2 weeks of treatment, serum bicarbonate increased by ≥3, ≥4, and ≥5 mEq/L in 52%, 39%, and 22% of patients, respectively, in the combined TRC101 dose group compared with 6%, 3%, and 0% of placebo-treated patients, respectively (Figure 4). In addition, at the end of treatment, 35% of patients in the combined TRC101 group had a serum bicarbonate level in the normal range (22–29 mEq/L) (summarized in Supplemental Table 5). Patients were followed for up to 2 weeks after the end of the treatment period; a decrease in serum bicarbonate of approximately 2.5–3.9 mEq/L from the end of treatment value was observed across the TRC101 dose groups, with serum bicarbonate levels returning nearly to the baseline values (Figure 3). Serum bicarbonate increased by ≥3, ≥4, and ≥5 mEq/L in 52%, 39%, and 22% of patients, respectively, in the combined TRC101 dose group compared with 6%, 3% and 0% of placebo-treated patients, respectively. Category of change from baseline in serum bicarbonate at day 15. Percentages of patients (y axis), including the percentages of patients (above bars) in the respective treatment groups, achieving defined increases of serum bicarbonate from baseline (x axis) corresponding to <2, ≥2, ≥3, ≥4, ≥5, ≥6, and ≥7 mEq/L are shown. The percentage of patients in the respective treatment groups achieving a defined increase of serum bicarbonate from baseline was calculated on the basis of the number of patients who reached the given value divided by the total number of patients in the treatment group (summarized in Figures 1 and 2). The numbers of patients in each treatment group attaining the given change from baseline in serum bicarbonate were <2 mEq/L (pooled placebo =27, TRC101 1.5 g twice daily =7, TRC101 6 g once daily =5, TRC101 3 g twice daily =11, TRC101 4.5 g twice daily =7), ≥2 mEq/L (pooled placebo =4, TRC101 1.5 g twice daily =18, TRC101 6 g once daily =23, TRC101 3 g twice daily =14, TRC101 4.5 g twice daily =19), ≥3 mEq/L (pooled placebo =2, TRC101 1.5 g twice daily =14, TRC101 6 g once daily =14, TRC101 3 g twice daily =10, TRC101 4.5 g twice daily =16), ≥4 mEq/L (pooled placebo =1, TRC101 1.5 g twice daily =8, TRC101 6 g once daily =12, TRC101 3 g twice daily =10, TRC101 4.5 g twice daily =11), ≥5 mEq/L (pooled placebo =0, TRC101 1.5 g twice daily =3, TRC101 6 g once daily =6, TRC101 3 g twice daily =6, TRC101 4.5 g twice daily =8), ≥6 mEq/L (pooled placebo =0, TRC101 1.5 g twice daily =3, TRC101 6 g once daily =5, TRC101 3 g twice daily =3, TRC101 4.5 g twice daily =4), and ≥7 mEq/L (pooled placebo =0, TRC101 1.5 g twice daily =1, TRC101 6 g once daily =1, TRC101 3 g twice daily =2, TRC101 4.5 g twice daily =2). All 135 randomized patients received TRC101 or placebo daily for 14 consecutive days, and all patients completed the study. No patients died or had any adverse events resulting in treatment discontinuation, and no patients suffered serious or severe adverse events. GI adverse events were the most commonly reported events in TRC101-treated patients, and all were mild or moderate in severity (Table 3). Diarrhea was the most common adverse event; all cases were mild, self-limited, and of short duration, and none required treatment. Treatment-emergent GI events, including diarrhea, were not dose related. There were no mean changes in electrolytes (i.e., sodium, potassium, chloride, magnesium, calcium, or phosphate), other than serum bicarbonate, in the patients treated with TRC101 (Table 4). Patients treated with TRC101 did not have any significant mean change in BP on day 15 relative to baseline values (Table 4). TRC101 did not induce metabolic alkalosis (i.e., serum bicarbonate >29 mEq/L) at any time in any patient. The TRCA-101 Study was a first in human, randomized, placebo-controlled trial to evaluate the efficacy and safety of TRC101 for the treatment of chronic metabolic acidosis associated with CKD. TRC101-treated patients had a significant increase in mean serum bicarbonate within 24–72 hours of treatment initiation that persisted through the entire treatment period, whereas there was no change in mean serum bicarbonate in patients given placebo. In the combined TRC101 treatment group, 39% of patients had a ≥4-mEq/L increase in serum bicarbonate at the end of the 14-day treatment period, and TRC101 led to a normalization of serum bicarbonate (22–29 mEq/L) in 35% of patients. After discontinuation of TRC101, serum bicarbonate levels decreased to baseline within a 2-week period. In this study, TRC101 was safe and well tolerated, and all patients completed the study. TRC101 is mechanistically distinct from bicarbonate supplementation as a means of correcting metabolic acidosis. TRC101 is an orally administered, insoluble, nonabsorbed polymer that selectively binds, retains, and removes H+ and Cl− under the pH and ionic conditions encountered in the human GI tract. The polymer is composed of low-swelling, spherical beads approximately 100 μm in diameter, and each bead is a single high molecular weight, crosslinked polyamine molecule. The high amine content of the polymer provides a substantial H+ binding capacity (5–10 mEq/g polymer), sufficient to achieve the desired effect of serum bicarbonate normalization in a daily dose of the drug that is small enough to ensure good patient compliance (e.g., <10 g/d). After protonated, the TRC101 polymer selectively binds the anion Cl−, thus preserving the effect of H+ binding. Extensive crosslinking within the polymer bead provides size exclusion properties, limiting access of larger, potentially competing anions and thereby, promoting selective Cl− binding. The selective binding of Cl− allows the unhindered GI absorption of larger anions from the intestine, such as short-chain fatty acids, that serve as bicarbonate equivalents after they are metabolized (39,40). Thus, serum bicarbonate is increased with TRC101 treatment without the addition of exogenous bicarbonate. The TRC101 mechanism of action mimics the physiologic response to gastric acid removal observed with persistent vomiting or nasogastric suction, where the acid removal results in an elevated serum bicarbonate level (41,42). TRC101 is not an exchange resin and binds HCl without introducing a counterion; thus, as expected, there were no mean changes in serum sodium, potassium, calcium, or magnesium during TRC101 treatment (summarized in Table 4). In the United States, there is currently no approved treatment for chronic metabolic acidosis, despite clinical practice guidelines recommending oral bicarbonate supplementation in patients with CKD to maintain serum bicarbonate ≥22 mEq/L (25,26,28,29,43). Previous studies have shown clinical benefits associated with sodium bicarbonate treatment of metabolic acidosis. However, these studies enrolled patients with CKD and mild metabolic acidosis and excluded patients with heart failure, uncontrolled hypertension, edema, and other chronic conditions that influence fluid status; consequently, the dose of sodium bicarbonate needed in these studies was typically ≤2 g/d (15,17–20,22). Effective treatment of metabolic acidosis in the broader population of patients with CKD likely requires an oral sodium bicarbonate dose of 2–6 g/d, which results in an additional sodium load of 24–72 mEq/d (0.55–1.65 g sodium per day) (28,29). In the context of CKD, hypertension, heart failure, and diabetic nephropathy, this additional sodium can increase the incidence of fluid accumulation and edema, while worsening BP (44). In this study, patients with CKD and mild to severe chronic metabolic acidosis along with hypertension, congestive heart failure, and volume-related disorders (edema) were included. Treatment with TRC101 induced a steady increase in serum bicarbonate that was observed in all dose groups during the 14-day treatment period, with a mean increase at the end of treatment of 3.2–3.9 mEq/L compared with the placebo group. The slope of serum bicarbonate increase did not appear to plateau during the 2-week treatment period, suggesting that the maximal effects of the TRC101 doses tested in the study have not been determined. On cessation of TRC101 treatment, serum bicarbonate returned nearly to baseline levels within 2 weeks, suggesting that continued treatment with TRC101 is needed to maintain elevated serum bicarbonate. TRC101 presented a favorable safety and tolerability profile; all 135 patients completed the study and took all scheduled study drug doses. There were no mean changes in serum parameters other than bicarbonate (i.e., sodium, chloride, calcium, potassium, phosphate, and magnesium), and no patient experienced an increase in serum bicarbonate that resulted in metabolic alkalosis (i.e., serum bicarbonate >29 mEq/L). Additionally, patients treated with TRC101 had no mean change in BP at the end of treatment, consistent with the sodium-free composition of TRC101. There are limitations to this study. The study was conducted in a controlled clinical and dietary environment with relatively short exposure (i.e., 14 days), and serum bicarbonate levels did not appear to plateau within the treatment period. In conclusion, this study showed that TRC101 was well tolerated in patients with CKD and metabolic acidosis, and treatment with TRC101 led to a rapid and sustained mean increase in serum bicarbonate, with 35% of TRC101-treated patients reaching the normal range. If longer-term studies support these initial results, TRC101, a novel, counterion-free, nonabsorbed polymer, may be a new therapeutic approach to the treatment of chronic metabolic acidosis in patients with CKD. D.A.B., T.H., and R.A. are consultants for Tricida Inc. (South San Francisco, CA). D.P., V.M., and E.L. are regulatory, clinical, and biostatistics contractors and consultants, respectively, for Tricida Inc. G.K., Y.S., C.L., S.M., A.L., and J.B. are employees of Tricida Inc. All authors take full responsibility for the content of the manuscript and had full access to the data in the study, ensuring the integrity of the data and the accuracy of the data analysis. The authors would like to thank Gena Yoon for generating tables and providing quality control review of data, figures, and tables. We also thank Kathleen Hill-Gallant for designing the meal plan for the study and Jun Shao, Geoff Parker, Ed Hejlek, and Wilhelm Stahl for review of the manuscript. This study was funded by Tricida Inc. South San Francisco, CA. The results were presented, in part, at the American Society of Nephrology Meeting, New Orleans, Louisiana, November 2–5, 2017. See related editorial, “New Frontiers in Treating Uremic Metabolic Acidosis,” on pages 4–5. This article contains supplemental material online at http://cjasn.asnjournals.org/lookup/suppl/doi:10.2215/CJN.07300717/-/DCSupplemental.